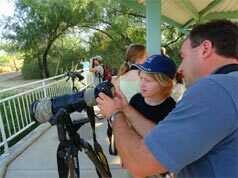 As a proud member of the Bird & Business Alliance and a sponsor of the Tucson Audubon Society, Ramada Tucson hotel is pleased to offer special rates for birding enthusiasts of all ages during the Tucson Bird & Wildlife Festival. Both guided and independent bird and nature walks are available year-round from a number of area locations within close proximity to the hotel. For personalized assistance for your group or individual needs, contact our sales associate at 520-239-2300 or via email sales@TheRiverparkInn.com. 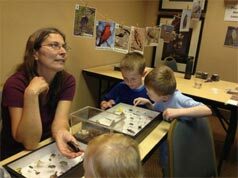 Another free tour, from 8:00 to 9:00 a.m. on Saturday mornings is presented at Tucson Audubon's Mason Center, 3835 West Hardy Road. The Mason Center Saturday Morning Bird Walks includes a brief presentation followed by a slow stroll around the half-mile trail. Advance signup is required. Contact volunteer@tucsonaudubson.org or call 520-209-1811. The Annual Bird & Wildlife Festival at Ramada Tucson will return August 12-16, 2015. 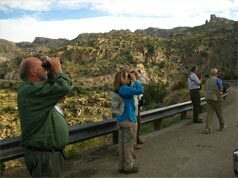 The 2014 festival was an outstanding success and we invite you to join in and experience southeast Arizona birding at its best -- enjoy the beautiful and fascinating Sonoran Desert and Sky Islands during this year's event. 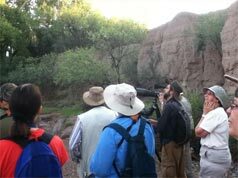 You will get to know our local birding and conservation community and experience the watchable wildlife accessible from Tucson. The festival includes field trips, workshops and exhibits as well as socials, banquets and breakfasts. Festival partners included the Tucson Audubon Society, Arizona Game & Fish Department, the Metropolitan Tucson Convention & Visitors Bureau and the U.S. Forest Service. We are looking forward to this coming year's event! Plan ahead and join in the fun at Ramada Tucson. Southern Arizona is home to 15 hummingbird species thus earning the nickname The Hummingbird Capital of the North America. The world-famous Hummingbird Aviary at the Arizona-Sonora Desert Museum is home to several hummingbird species including the Magnificent, Black-chinned, Broad-tailed and Annas. While Ramada Tucson is conveniently located to top birding destinations, you will also find this full-service AAA 3 diamond hotel's resort-like settings and relaxing atmosphere perfect when traveling alone or in a group. The hotel is conveniently located within walking distance of the Tucson Convention Center and near sightseeing, shopping and dining, and other attractions which make this growing and vibrant desert community so unique. Enjoy the heated outdoor swimming pool, spa, fire-pit, social area with fireplace and other delightful extras, including a daily complimentary Full American Breakfast. We at Ramada Tucson are proud to announce that we have teamed up with the Tucson Audubon Society to offer these great packages. *Packages and certain amenities may not be available during Major Holidays and Special Events (Pueblo Gem & Mineral Show, etc.). All packages are subject to availability. Tucson Audubon Society's "Finding Birds in Southeast Arizona"
A 2-CD set of bird songs of Southeastern AZ and Sonora Mexico"